"X3" (2015) by Ed Belbruno captures the mathematical side of describing space and the origins of the universe. "X3" and the other paintings that will be on display in New York on Oct. 22 are colorful windows into the mathematician's mind. Find Ed Belbruno’s original art work and limited edition prints at the Space.com store. "If [viewers] haven't met me, they look at those paintings, they would just scratch their head and say, 'I have no idea what this is,'" Belbruno told Space.com. But an understanding of the mathematical work Belbruno does — including cosmologyand applying chaos mathematics to space trajectories — lends a new clarity to his art, he says: "Suddenly, the different imagery in the paintings and the abstraction of the paintings makes sense to [the viewer]," he said. "That's important." "Diophantine Flow" (2010) is one of Edward Belbruno's works that reflects back to a pastel work he did in 1986 that helped him come up with a new way for spacecraft to slow down in space without using fuel. A new collection of works by Belbruno will be on display Oct. 22 from 5 p.m. to 9 p.m. EDT at Café Minerva in New York City. Belbruno began his science career working on orbital trajectories. The path of a spacecraft is influenced by the gravity of nearby bodies that are also moving, so before a craft is launched, mathematicians spend time calculating the best course from starting point to destination — one that is safe and doesn't use too much fuel. And from the beginning, Belbruno says his artwork has made it possible for his subconscious mind to grapple with the tangible dilemmas he was dealing with in the office. 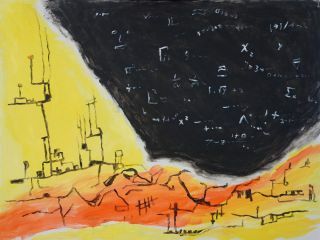 For example, as described in the new documentary "Painting the Way to the Moon" (2015), Belbruno says that while he was working at NASA's Jet Propulsion Laboratory, a pastel painting helped him solve a vital spaceflight problem: how to get a spacecraft from the Earth to the moon with very little fuel, which is called a ballistic lunar capture. The craft would have to ride delicately through the transitions between the Earth and moon's gravity so it could slow down at the right time without using its engines. Calculating such a maneuver is an incredibly complicated task. In an essay for Space.com, Belbruno wrote: "[I] let my subconscious try and find the route. I painted the Earth-moon system so fast that I couldn't think, and my hands were guided from a subconscious level." "When I finished the painting, […] the brush strokes of the pastel revealed a special path from the Earth to lunar orbit," Belbruno wrote. "In the pastel, one sees slightly darker pastel marks making their way from a region around the Earth to a region around the Moon. The regions reveal a somewhat circular pattern that gradually tapers off. The boundary of those regions is where the trajectory starts and ends." Later, in 1991, the ballistic-capture strategy was put to the test when Belbruno and a colleague designed a route to take a stranded Japanese spacecraft to the moon from Earth with a severely limited fuel supply. Incidentally, Belbruno also calculated a faster way to get to Mars— even faster, he says, than the path planned for an emergency supply probe described in the book "The Martian." But it was after he started researching cosmology at Princeton University in New Jersey, that Belbruno says his art really took flight. It's still a bit of a puzzle how the two are connected. "All I know is that around 2010 when my styles really exploded — and now they're going in all different directions — I noticed that my scientific work […] exploded, too," Belbruno told Space.com. Trajectories are straightforward, concrete calculations, even if complex: "You are simply going from A to B in a spacecraft," he said. "Whereas the cosmology work, and black holes, is wildly more complicated and you're dealing with the entire universe." Belbruno's painting "Transitions," from 2014, represented a complete departure from his previous style and showed a hidden dimensional aspect to reality. A new collection of works by Belbruno will be on display Oct. 22 from 5 p.m. to 9 p.m. EDT at Café Minerva in New York City. He can't tell which direction the feedback goes, from art to science or the other way: "Which one is feeding off the other one, I have no idea," he said. Belbruno continues to find clues to his scientific process within his artwork. As he described in a recent Op-Ed, he spent eight years grappling with how to mathematically describe the Big Bang. He then found his ultimate solution — tracking two different time scales to smoothly transition across the mathematically tricky singularity — had been foretold five years earlierin his painting "Time." Visitors to Thursday's gallery event will be able to look into the universe as Belbruno tries to interpret it: "They're probably very curious, if [the paintings are] going to give them any science insights into our universe," Belbruno said. "And my guess is the answer's going to be 'yes.' That it enriches their understanding of the science in a way in which they didn't see previously. If that happens, I'll be really happy."